Photos from our November 21 Rider Engagement Event! 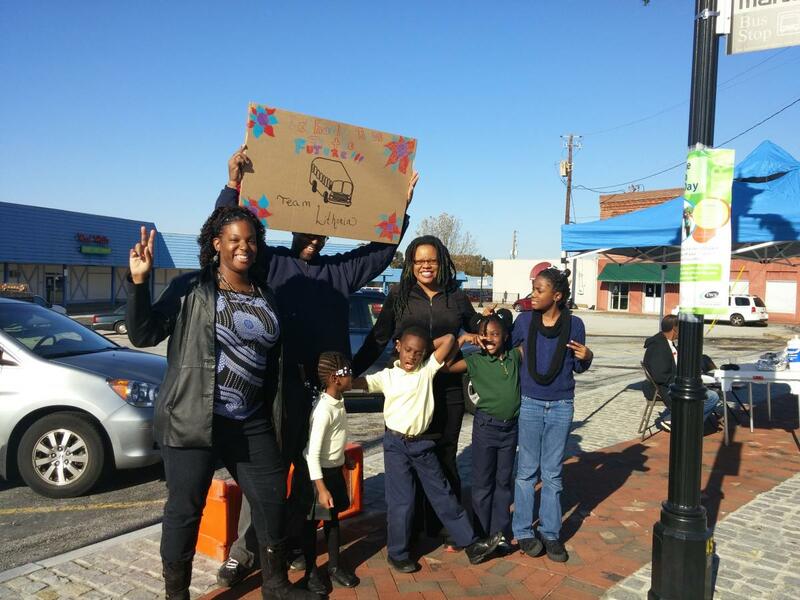 The "Ride to the Future" project is part of a series of tactical urbanism efforts that aim at revamping the look, and renewing the spirit of the City of Lithonia. Our project will consist of installing a bench and matching trash can with a shelter, at one bus stop in downtown Lithonia that only has a stop sign. A group of volunteers, in partnership with the City and local businesses, will help clean and beautify the surrounding area and interact with the riders. The local transit authority will also help by equipping another bus stop. A survey will be conducted in order to get riders' opinions about the city, and about ways to improve their riding experience in the long run. 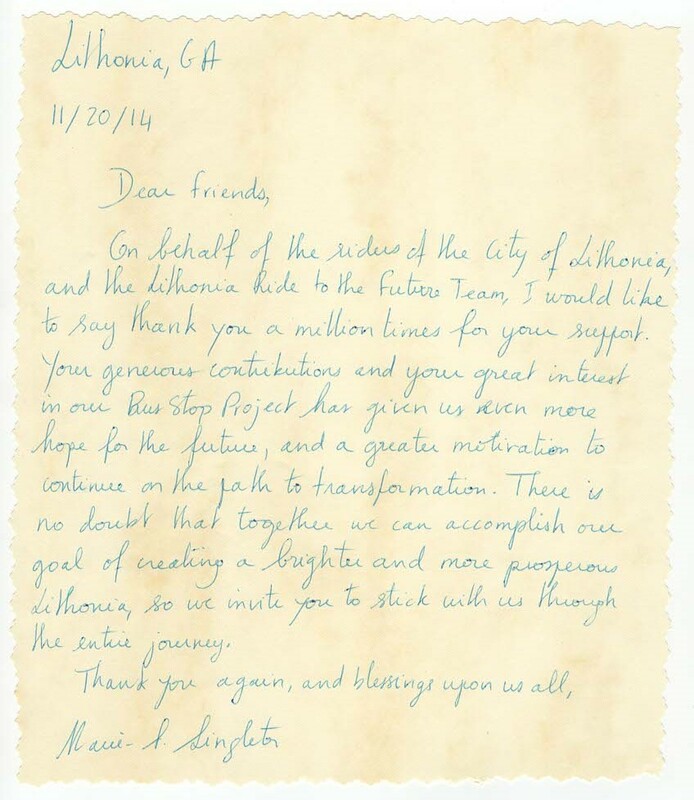 Information will also be distributed about the city's history and future plans. A bulletin board will also be created within the new shelter to present information about the City of Lithonia, and about current activities. Our goal is not only to improve the public transportation experience of our residents and visitors, but also to increase the ridership of the bus lines in the downtown area. This will mean more foot traffic within the city limits, and consequently, more potential customers for our local businesses. Online purchase of benches, trash cans, and other materials for the shelter. Design and printing of survey and informational materials. Gathering/purchasing of beautifying and cleaning material. Launching of the week-long "Ride to the Future" project. The contractor will build the shelters and install the benches and trash cans. Temporary seating will be available for the riders while work is being performed. Volunteers will engage the riders through discussions on various issues. Area beautification and cleaning will take place, while volunteers conduct surveys and distribute flyers. As part of the entertainment strategy, we will bring some food trucks for free coffee and snacks, and play some music. 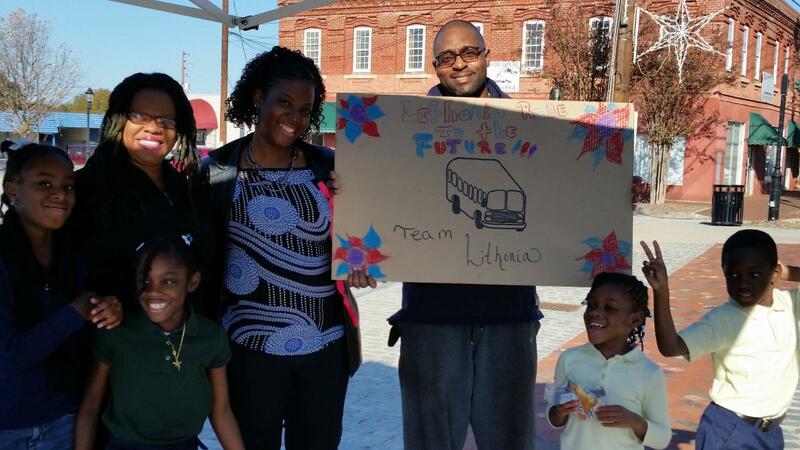 The City of Lithonia is currently implementing its Community Development Agenda, with a main focus on the downtown area. As listed under the TRANSPORTATION category of the community plan, there is a need to expand transportation options, and to improve the quality of our existing transit centers. Too often, bus riders in Lithonia are forced to wait for the bus under all kinds of inclement weather, for lack of adequate transit center equipment. The transit authority can only provide shelters to the stops with high ridership due to restricted funding. Riders are left to seek shelter nearby, or walk to the few better-equiped bus stops. The Trick Out My Trip project fits perfectly in the Lithonia Community Agenda, as it will help us address an immediate concern. It's also an opportunity to engage the community, and to further our partnership with the local transit authority, who will look at ways to improve other bus stops in the area. 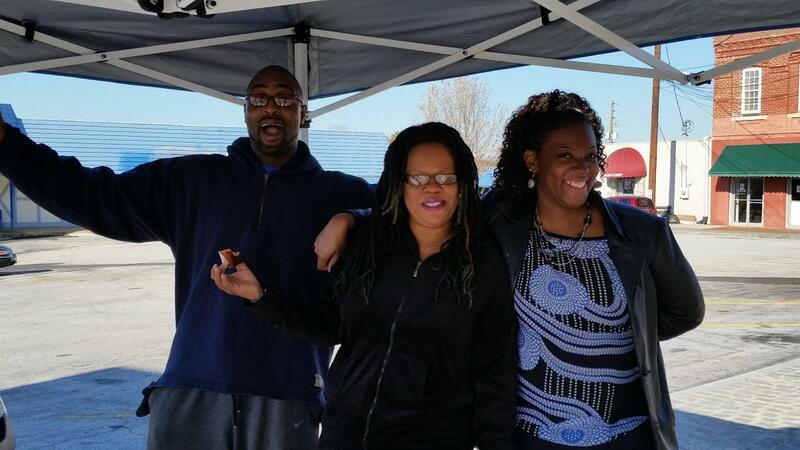 Talk to riders and share information about Lithonia.